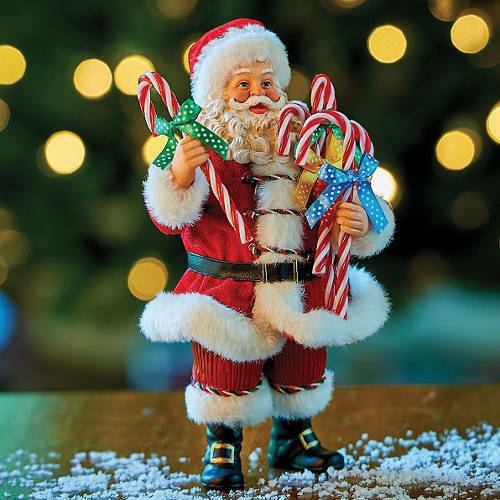 Give this Possible Dreams® Candy Cane Wishes Santa Christmas Decoration a starring role in your holiday decorations. Designed by Ann Dezendorf, this special Santa figurine has a fistful of acrylic candy canes with polka dotted bows as he joyfully hands one out to the next good boy or girl (or adult!) Constructed of resin and Clothique™, a 50/50 cotton poly blend that is specifically stiffened to add realism and detail, this collectible Santa has hand-painted facial features that express the sincere emotions highly prized by fans of the technique. Dressed in his standard Santa suit with fur-like trim and black boots accented with gold buckles, Santa looks as jolly as ever as he prepares to reward his believers with a sweet treat. Collectors in your life are sure to cherish the prized collectible and deem it one of their favorites. Share it with a friend or keep it for yourself to start your own collection. 6″W x 6-1/2″D x 10-1/2″H; 1 lb.